Music (vocal & instrumental) heard during Shakespeare's lifetime and tied directly to his plays - performed on historical instruments. In this stellar recording, Ensemble Chaconne offers a rare and compelling view of the music Shakespeare’s audiences would have heard, including music by the great composers of his day (Thomas Morley, Robert Johnson, John Dowland, and others), as well as popular tunes of the period. The CD features vivid performances by the acclaimed period-instrument trio, while showcasing Ms. Dellal’s versatility and dramatic flair in a variety of songs from the plays, from love songs and comic antics to madness and tragedy. Among the many selections are “Willow, Willow” sung by Desdemona before her murder in Othello; “It Was a Lover and His Lasse” (As You Like It); “O Mistress Mine” (Twelfth Night); “Hark, Hark! The Lark” (Cymbeline); “Take O Take Those Lips Away” (Measure for Measure); “Full Fathom Five” (The Tempest), "Go from My Window” from Ophelia’s mad scene in Hamlet; and “Greensleeves,” the famous ballad tune quoted in The Merry Wives of Windsor, an allusion to women of ill repute, recognized by their green sleeves. Celebrating its 23rd season in 2008-2009, ENSEMBLE CHACONNE is dedicated to vivid, historically-informed performance of Renaissance and Baroque music on period instruments. 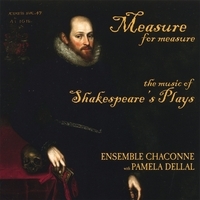 The ensemble’s Measure for Measure was selected as featured concert at the 2002 National Meeting of the American Musicological Society Society and was presented by the Royal Shakespeare Company’s 2006 residency project at Davidson College. Ensemble Chaconne has concertized widely, appearing at venues such as Atlanta's famed Spivey Hall; Boston's legendary Jordan Hall; the Bach Festival Society of Winter Park, Florida; University of North Carolina at Charlotte, Kenyon College, Bowdoin College, Boston’s Museum of Fine Arts, and many more. GUEST ARTIST PAMELA DELLAL has toured the United States, Europe, Australia and Japan and has recorded for Arabesque Records, Artona, BMG, Dorian, Meridian, and KOCH International. Her singing has been called “outstanding” (The New York Times) and “lushly fluid” (The Washington Post), and she has been praised for her “gleaming vocal colors and firm, steady tone, a sure sense of dramatic portrayal and faultless musicianship” (The Boston Globe).